This event gives investors the opportunity to pitch their real estate property investment opportunity to the “SHARKS” (aka, investors, contractor/rehabbers, hard money investors, financial analysts, attorneys, etc.). Are you A New Investor and Want to Learn How to Pitch Your Deals? Have you ever considered buying investment real estate? Are you curious about how you would go about analyzing the financial details of the property you are considering buying? How you would go about figuring out if the property were a good deal or rip-off? When presenting to investors, the entire purpose is to convince them that YOU are the person they are going to invest their money and make a lot of money in return. “The world of real estate investing is both exciting and lucrative but not without the basic fundamentals of property analysis, market analysis and financials. Mid-Atlantic REIA gives its members the opportunity to put their training to the real world of investing for those ready, willing and able to take the challenge. 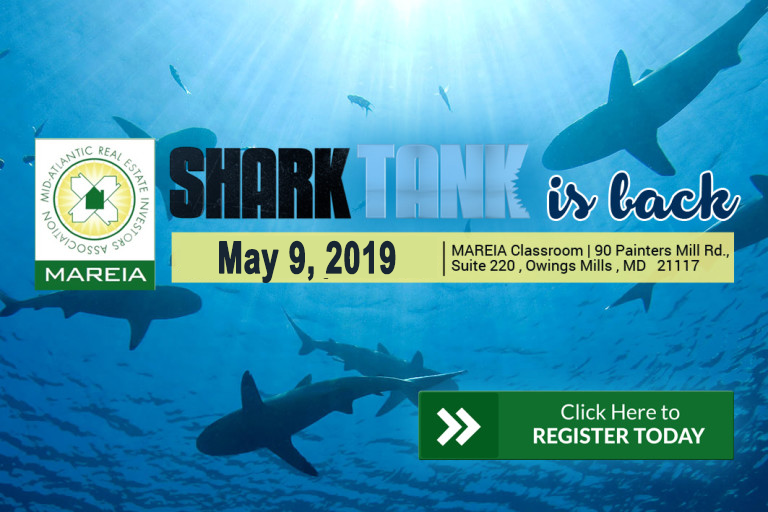 This is an opportunity to learn or improve YOUR pitching skills as shark participants receive on-the-spot feedback, delivery techniques, and strategies for immediate improvement. This Event is FREE for Members and $20 for Non Members.